Keya modeling a shawl she knit with handspun silk/Merino and Wensleydale locks at the Georgia Alpaca FiberFest. I’m always fascinated by the paths that fiber artists take, and Keya Kuhn of Cedar Hill Farm Company certainly intrigued me when she first posted to Indie Untangled back in July. 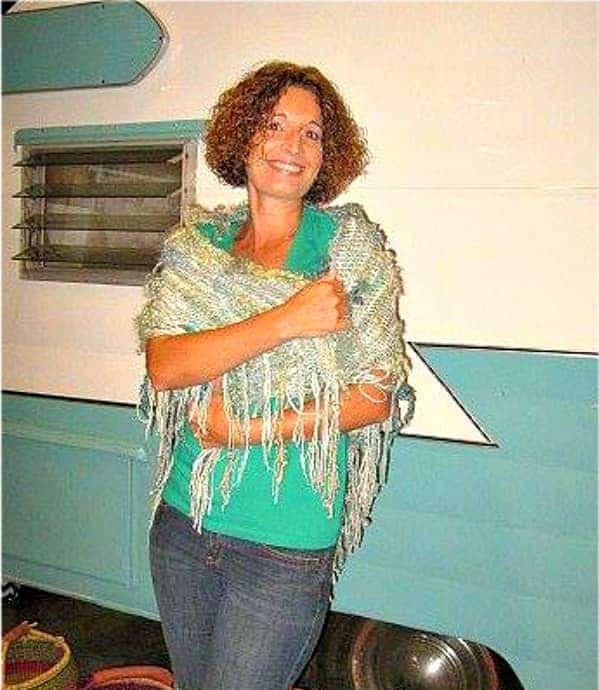 After a 15-year career teaching secondary school English in Georgia, and after a few years of dyeing out of her small kitchen, Keya and her husband moved to a farm in the Northeast Georgia mountains, taking the plunge and starting along the country road of running a fully functional fiber farm. These days, Keya spends her time dyeing organic yarns and fibers and designing knitwear, along with raising sheep and growing organic, pesticide-free fruits and vegetables, which she and her husband share with their neighbors in the unique, agrarian community. How did you and your husband decide to move to a farm? My husband and I, over the years, have come to the realization that what makes us most happy is self-sufficiency. We enjoy being able to eat the organic food that we grow and raise at home in our small, 6,000-square-foot garden and on our farm. The catalyst, however, to making the leap to purchasing a small farm and joining the agrarian society of the community in which we live was really the fact that we have become collectors of stray cats and dogs. A subdivision is no place for keeping a large number of pets, and our dogs and cats needed space on which to run. So, in 2013 we said “good-bye” to city limits and traffic lights and moved to North Georgia. What’s the average day on the farm like and how do you make time for dyeing and designing patterns? The thing about a farm is that it requires two completely opposing strategies. First, it requires a regimented morning routine for the feeding and general maintenance of the animals. The roosters begin complaining that they need breakfast before the sun rises and the sheep begin calling for their breakfast not long afterward. The other strategy is the go-with-the-flow strategy. As much as I like to follow a routine, we have learned that the best laid plans usually go right out the window 10 minutes after they are made. At the vey least, you can always count on Mother Nature to make a mess of your plans. 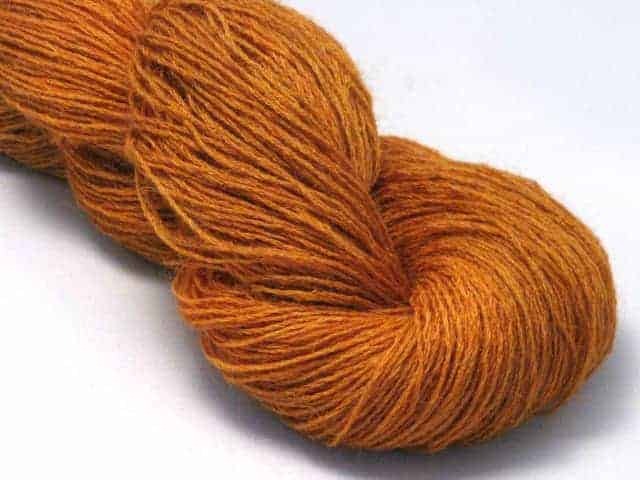 So, basically, once I get the initial animal chores out of the way in the morning, I do my dyeing and designing and knitting in-between whatever else comes up during the day. However, if I am struck with a design idea that I just have to get down, I usually drop everything. How many and what kinds of animals do you have? Currently we have 23 chickens, 10 dwarf rabbits, one English angora rabbit, two horses, an Ethopian donkey, and sheep. Our sheep are two breeds, Teeswater and Corrie/Finn Crosses. We are planning to cross the Teeswater with the Corrie/Finn to develop a fine, thick fleece of silken ringlets that will be akin to the softness of alpaca. Have you started selling your produce yet at local markets? We don’t sell our vegetables. We live in a nifty farming community where we help each other out with planting and harvesting and share the things that are unique to each garden. I say garden, but some of my farm neighbors have 3 and 4 acre “gardens.” It’s not really a barter system… it’s more of an what’s-mine-is-yours system. How did you choose the name Cedar Hill Farm Company? Is there a special meaning behind that? Our house sits on a hill, and we share that hill with a massive Lebanon Cedar tree. Lebanon Cedar is not native to our area so it seemed like a good symbol for a farm that raises sheep for wool in a beef cattle community. I learned to knit by watching my grandmother knit mittens and socks, I think. Over the years, of course, my mom helped me to explore the facets of knitting, crochet, lace, embroidery, and sewing. My addiction to knitting, however, really didn’t begin until about 2007, which I can’t explain, and that led to wanting to breech the gap between the colors of yarn I wanted to knit with and what was available to me. 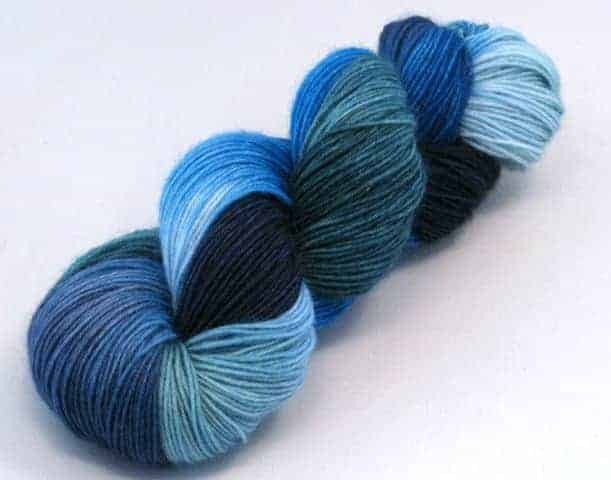 In 2010, I began experimenting with dyeing yarn. That led to my taking the risk of putting some of my own patterns on the Internet, and ultimately to the path I am following now. 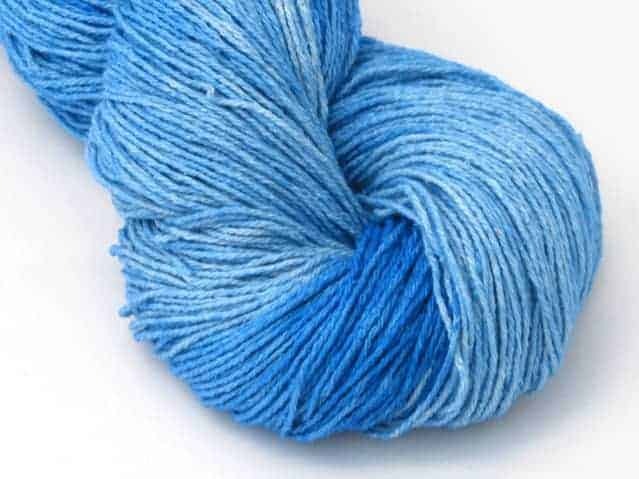 My favorite color is evident across the different brand labels of my yarn: Brandeis Blue. Basically, it’s that bright, azure blue of the Mediterranean water. How would you say your color preferences have changed after becoming a dyer? You know, that’s the thing about being a dyer that makes it fun… I dye the colors that I like, which are bold, bright colors. I started dyeing yarn because nobody had Brandeis Blue or kettle dyed marigold or green apple green. The color palette of the brand name yarn companies was limited to an excess of pastels, dark and dreary colors, or Christmas red and green. I enjoy, much like a painter, to mix colors and saturate my yarn with as much color as it can stand. What does the future hold for Cedar Hill Farm Company? I think we’ll just keep doing what we are doing so long as it makes us happy. We absolutely love where we are and the lifestyle we’ve chosen for our family. We have a few big-ticket items that need to be added to the farm to improve our ability to grow our flock, and then we are thinking of building our own fiber mill. I try to participate in and/or sponsor at least three fiber events each year in the Southeast. This year we’ve sponsored and I’ve taught knitting classes at fiber festivals in Alabama and Georgia, and my last event of the year will be the Royal Alpaca Challenge in November in Conyers, Ga. I think we are on the path we were meant to follow and we are going to stick to this path for as far as it takes us, and I’ll keep dyeing eye-popping yarn and designing for as long as there’s enjoyment in it. Keya has generously offered a hank of her Rocket Sock Medium in the Fathom colorway. 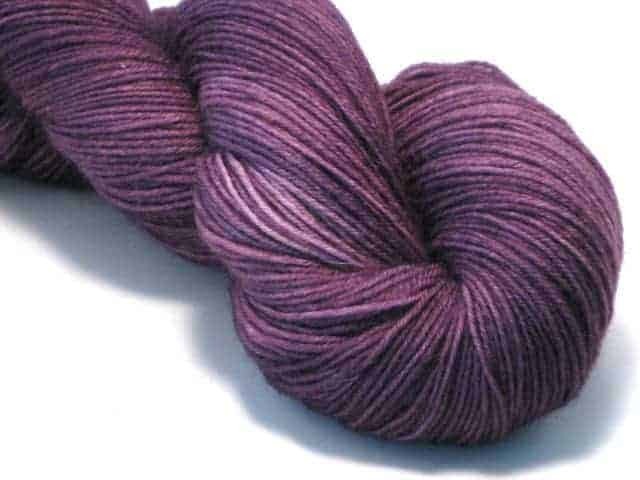 To enter, comment and tell us what you would make with this beautiful skein. You have until the end of the day my time on Wednesday, Nov. 12, to comment. Good luck! 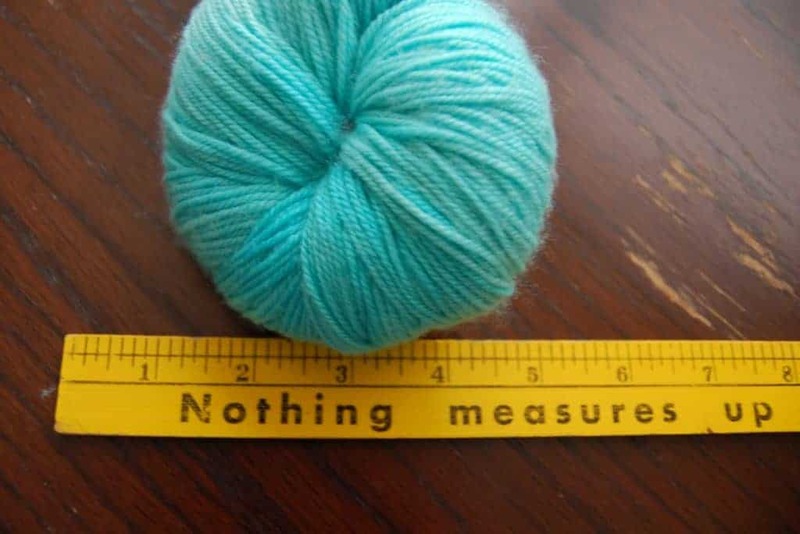 This entry was posted in Q&A and tagged free stuff, giveaway, indies, interview, yarn. I would make a cowl. Blue goes with almost everything. I would probably pair it up with a nice neutral and make something like the Foolproof Cowl. I would definitely make a beautiful pair of socks! I think this would be the perfect yarn for a pair of socks. Love the color. Anything would be beautiful made with this. But I think I would knit either a shawl or a cowl. I think this skein would be perfect for “Little Purls of Wisdom”v by Carol Sulcoski. Thank you for the giveaway! i am into mittens right now and so I would make a pair of Linden mittens by Jane Richardson. I would knit the Linden mittens by Jane Richardson. i am so into mittens right now! What beautiful colors! I think I might make a Sockhead Hat. I’m having trouble choosing. Should it be a pair of toasty-twist-socks or a hitchhiker. It would be a beautiful pair of socks, but at the same time I’d love to have the colors near the face in a lovely scarf. Choices, choices. I would make a lovely cowl! Beautiful color! What a beautiful yarn and it’s great to learn about the Cedar Hill Farm Company. Thank you for providing another organic yarn option. I’d make a shawlette with this. I’m not sure, maybe a cowl. One thing for sure. It would make a fantastic anything. The colorway is gorgeous, a cowl or shawlette something worn near the face. Great backstory and great giveaway! Thank you. I would make a lovely pair of socks for my son.